An infographics is one of the most useful ways to display and communicate information online, as they are easily shareable by nature, and can take complex thoughts and statistics and boil them down into ‘byte-size’ graphics. But often times creating an infographic can be stressful and time-consuming. Below are some tips and tricks to help create the perfect infographic, along with examples of how we at Tier10 created one of our most successful infographics, “Exit Sandman”. Any good infographic first needs a topic. This could range from 2014 social media user statistics, different types of coffee, to information about how we dream. Without a topic, an infographic simply doesn’t exist. Keep in mind that the topic shouldn’t be so obscure that finding information about it becomes difficult. 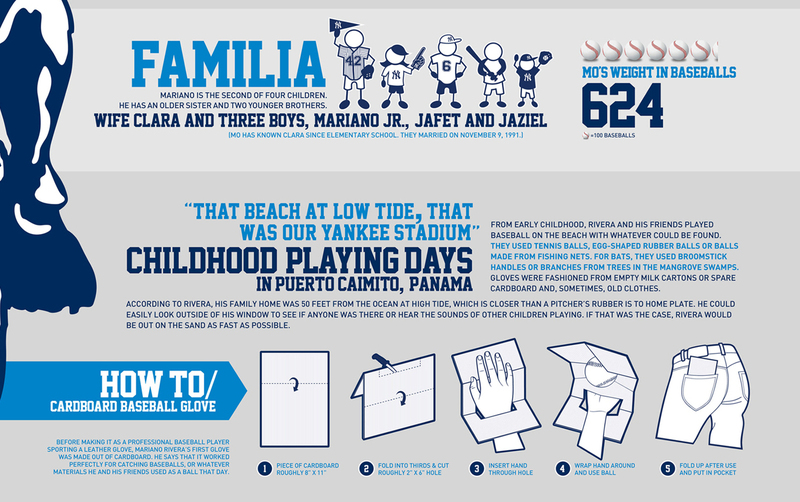 For Tier10’s “Exit Sandman” infographic we decided to depict the life and career of the legendary New York Yankees closer Mariano Rivera. 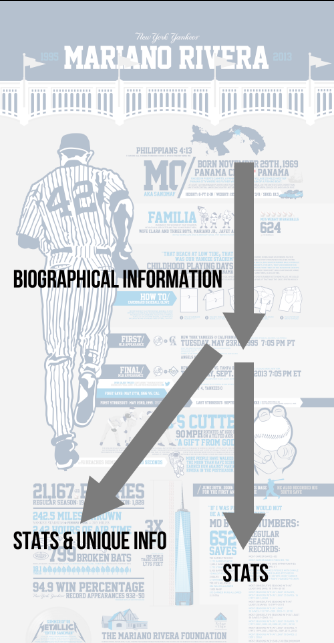 The infographic was created around the time of his retirement from baseball. You can find more information about the background of the infographic here. After choosing a topic, the next best thing to do is to find the data. Usually this is an endless list of statistics that relates to the topic. The key is to choose different kinds of data to display. Having the same type of stat can be beneficial when trying to explain information verbally, but visually it can get tiring fast. 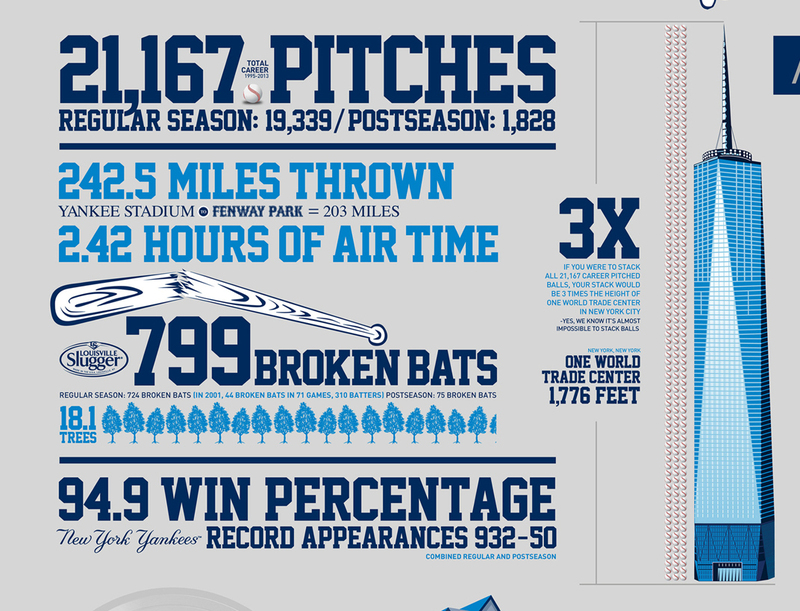 For example, within our infographic we just didn’t focus on Mo’s baseball statistics, though we could’ve made an entire infographic just featuring those. Because we chose to depict his life and overall journey, we took biographical and anecdotal facts and incorporated them into the final product. This not only added uniqueness to the infographic, but it helped break up what could be a very repetitive chart. Having a visual theme is just as important as the statistics depicted within it. Without a consistent visual theme the “flow” of the infographic can be thrown off. If certain elements within the infographic are designed differently it could affect how the human eye travels through the piece and, in turn, limit the amount of information received from the infographic, or even worse, cause the reader to click away. As you can see from our infographic, only 4 primary colors were used – white, grey, dark blue and light blue. We also rotated between two fonts, with one font being used for the main headlines while the other is used for general copy. These choices provide visual consistency throughout our infographic and allows the viewer to progress through the infographic with minimal distractions. The “flow” of the infographic not only refers to the visual theme and other design choices but also the layout of the graphics and information itself. Not planning out where different elements will go can cause the infographic to become just as cluttered or incoherent as it would be if the same visual theme was not used. To organize our infographic and visual elements, we simply followed a chronological timeline of Mo’s life and career starting with his early years in Cuba and then adding in key moments, stats and unique facts throughout. 5. Infographics should be fun! Last but not least, remember that infographics should be fun! Statistics can be boring, plain and simple. The benefit of an infographic is the ability to take that dull number and translate it into something easily relatable. A true Yankees fan might know that Mo had 652 saves in his career, but would they know that if they stacked all of his career pitches it would be three times the size of One World Trade Center? The ability to translate complex thoughts and ideas via a sequence of images greatly reduces the knowledge barrier for a reader. Infographics can prove to be a great method of showing off your or your company’s creative side. Error - Error validating access token: Session has expired on Tuesday, 06-Feb-18 09:00:00 PST. The current time is Thursday, 25-Apr-19 12:52:45 PDT.